State Rep. Liz Linehan discussing health care costs with U.S. Sen. Chris Murphy during roundtable event. 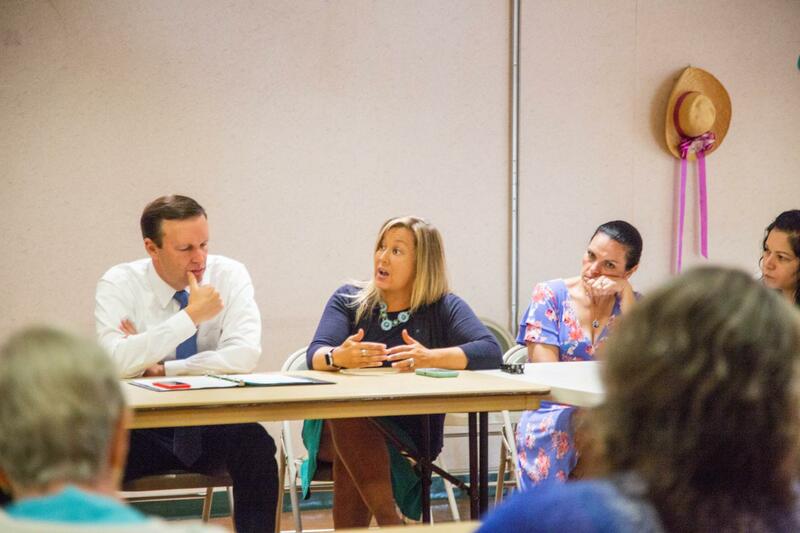 I joined U.S. Sen. Chris Murphy (D-CT) to discuss the rising cost of health care with several Cheshire residents during a roundtable panel discussion at the Cheshire Senior Center on Monday, July 30. Our panel included representatives from Healthcare Advocate, Access Health Connecticut, Waterbury Hospital, Planned Parenthood and NARAL, and more. I am committed to listening to my constituents’ concerns and acting on them during the next legislative session. During this year’s session, I co-introduced legislation that was signed into law to protect the most popular and important parts of health care policies sold in Connecticut, which included the Ten Essential Health Benefits. If you are experiencing difficulties with their insurance policies, contact the Office of the Healthcare Advocate, or you may contact my office directly for help. I have partnered with the Healthcare Advocate, Ted Doolittle, in helping constituents successfully navigate coverage problems in the past. Please check out the event’s videos I have posted below!